Their wolfish looks suggest their northern heritage, but they are no closer to being wolves than any other purebred dog. The Siberian Husky is a medium-sized working dog. Their height ranges between 21 to 23½ inches at the withers (measured from ground to base of neck) for males and 20 to 22 inches at the withers for females. Typically, Siberian Huskies weigh 45 to 60 pounds for males and 35 to 50 pounds for females. Often people envision these beautiful dogs as much larger than they are, but they were bred to be moderately compact in build. Despite this, these agile dogs are not only quick and light on their feet, they are also exceptionally strong for their size. In action, these dogs move freely, effortlessly, and gracefully over practically any terrain. In fact, they will happily perform their original function in harness most capably, carrying a light load at a moderate speed over great distances. This may come as a surprise to many, but the Siberian Husky comes in many colors ranging from black to pure white and everything in between—including copper, red, agouti, and sable. 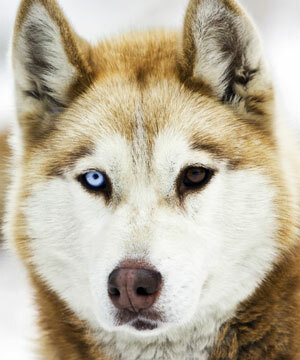 Huskies can even have a variety of markings and striking patterns not found in other breeds. If you'd like to learn about the Siberian Husky breed, see 250+ different Sibes, and all the colors of the Siberian this is a very good place to start. 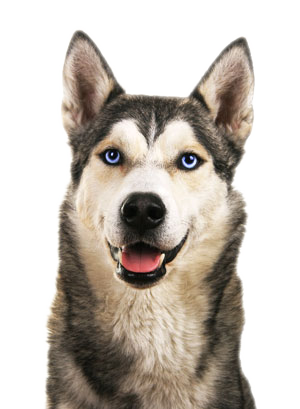 In order to live through those harsh winter months of the North, Siberian Huskies were blessed with a thick coat. Their double coat is medium in length and is very effective in insulating them, keeping them both warm in the cold winter months and cool in the hot summers. The undercoat is soft and dense and of sufficient length to support the outer coat. The guard hairs of the outer coat are straight and somewhat smooth lying on their body. The undercoat typically sheds from the Siberian twice a year, during the change of season. Their coat requires little maintenance; that is, minimal brushing and bathing are needed, except for those Siberians who have what is called a "wooly coat." The recessive trait of a "wooly" yields a longer coat, which requires frequent brushing to avoid matting. Note that while they may seem to have a thick coat, it does protect them during warm months and in warmer climates. One should never consider shaving their husky's fur in an effort to help them cool down. Their faces behold an expression that is keen but friendly. It almost warns of their mischievous side. Their ears are well-furred, erect, and triangular in shape, with rounded tips. Their noses can also range in color from black, liver, or even a flesh-color. The noses of some Siberians can even have a pink-streaked "snow nose" that gets paler during the winter months. Their eyes are typically almond shaped and moderately spaced. Their eyes can range in color, with both eyes not necessarily being the same color; for instance, two blue eyes, two brown eyes, one of each (bi-eyed), or even one eye with both brown and blue in it (parti-eye).